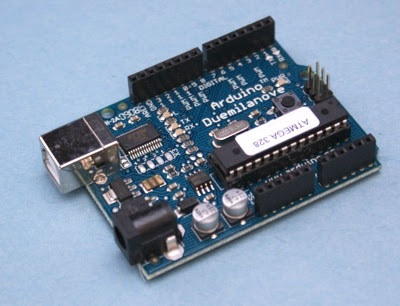 I have just ordered the Arduino Duemilanove board from Hacktronics.com for $35 shipped. It was recommended by some folks I met at a hacker space in DC called HacDC. My goal is to integrate the ardupilot which is a separate board into a UAV (unmanned aerial vehicle) that can fly to waypoints using a GPS module. The Arduino will get me started on the basics that will enable me to learn a thing or two about a microcontroller. This board has some very cool shields that can be attached to it like an ethernet shield that can basically enable you to control this board from anywhere in the world. Think about the possibilities, you could adjust the temperature of your a/c at home from any computer that has an internet connection. Better yet, it is opensource. I hope to blog about the various stuff I learn about this board hoping to provide some other noobie out there looking to get into microcontrollers. I have been waiting a while to take this step and actually purchase one and now I can't wait to get it in the mail!